It’s been a while since we’ve seen companies on all levels of the beer industry, from truly micro to massive and intercontinental, be so united in chasing a particular style trend. Thanks to the explosive growth and all-around category dominance of AB InBev’s Michelob Ultra, pretty much everyone else has been left chasing the low-cal, low-carb dragon. Combined with the related, emerging popularity (and now-proven viability) of light craft brewery lagers, we’re looking at a landscape where low-ABV lagers have returned to the forefront after decades of being the demon against which the craft industry defined itself. Everyone naturally wants a piece of this pie, given that it’s one of the only areas of the beer market that seems to be growing rather than contracting. Imitators, unsurprisingly, have appeared across the entire industry. Some hail from other major brewers, or from AB InBev itself. Some come from craft breweries, pumping out products that you’d swear had been made by the likes of AB InBev, and only further blurring the lines between the styles produced by “craft” and non-craft brewers. Today, though, you can chalk up two more newcomers vying for that same share of the market, and they both come by way of MillerCoors. Press releases about both of the following products hit my inbox today within hours of each other, and considering they’re both former craft breweries that were bought out by MillerCoors in the last four years, you have to wonder if there’s an overarching strategy at play, at least in terms of timing. Could it be that MillerCoors is hoping their biggest brand in this field could end up being something under a more authentically “craft-like” umbrella than the tired likes of Miller 64? 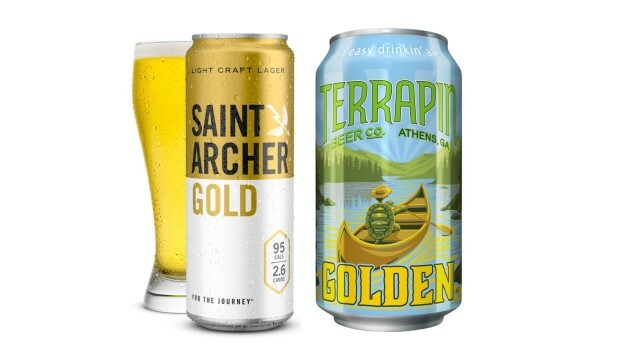 The first press release to arrive today was for St. Archer Brewing Co.’s “Saint Archer Gold,” a “helles-inspired” lager that seems to lift its entire ethos directly from Michelob Ultra, while simultaneously copying the design aesthetic of the newer, organic Michelob Ultra Pure Gold. Like Mich Ultra, it has 95 calories. Like Mich Ultra, it has 2.6 grams of carbs. And like Mich Ultra, it has an ABV of 4.2 percent. The only thing about this beer that isn’t exactly the same as Mich Ultra is the label, which seems more inspired by Pure Gold. Just look at these two side by side—they’re not even trying to hide the thievery here. The St. Archer release is guileless enough that there’s no real point in discussing its intended market or effect—the description alone makes that quite clear. More unusual is the second of the two press releases I received today, this one from Athens, GA’s Terrapin Beer Co. THIS press release announces a change to one of the brewery’s longest running, most important beers, Terrapin Golden Ale. It simultaneously states that the revamped Golden Ale will go from being a Georgia-only release to one that will be rolled out in all 19 states of Terrapin’s distribution, which can mean only one obvious thing: They’re hoping this beer is going to be a big deal for them. Please note the inherent duplicity in stating that your beer will have “fewer calories than before” in your press release without actually stating how many calories the beer will now contain anywhere in the same release. Given that the old Terrapin Golden Ale had roughly 150 calories per 12 oz serving, we can only assume that even at 4.6 percent ABV, the number is still high enough that it looks “too high” in writing when compared to the 95 calories of a Mich Ultra or the 85 of a Mich Ultra Pure Gold. What other reason would Terrapin have to withhold that information from the press release, aside from the fact that they’d simply prefer you associate the new version of Golden Ale as being “healthier”? It’s hard to say whether either of these brands will ultimately go on to make a splash. Will a straight-up Mich Ultra clone from St. Archer move the needle for MillerCoors? Will the residents of 19 states be excited by the prospect of a lower-ABV version of a Terrapin classic, with the promise that it’s vaguely “lower calorie” than before? Or are they already too late to this particular party? Oh, and regardless of what happens, can we say a final goodbye to Miller 64?